On the surface, a grocery store, luxury retailer, and a budget motel chain may not seem like they have too much in common. But when it comes to omnichannel marketing examples, top brands are pushing boundaries when it comes to customer experience. Many shoppers use phones while they’re in stores to research products and others may discover a store or a product while the’re on the go. Maybe they continue evaluating on a different device or they’re ready to buy now. At any point, a shopper could decide to switch channels. And companies need to be prepared. From their cross-channel loyalty program to their robust social media integrations, Nordstrom makes it easy for their customers to buy what they want, when they want it. Their cross-channel loyalty program rewards shoppers for purchases made either online or in-stores, including outlet stores. Their social media integrations with Instagram and Pinterest allow shoppers to buy the products see across their devices once they’re in-store, and if stylist advice is needed, booking a complimentary, in-person appointment via their website and mobile app is just a few clicks away. Shopper convenience is their priority to guarantee shopper loyalty. To succeed in a social-driven world, retailers must make it easy for shoppers to buy what they see, when they see it – whether online or in person. 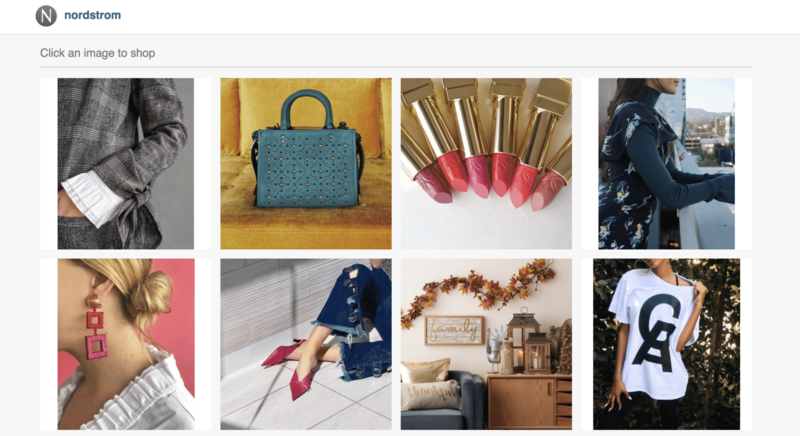 Nordstrom’s Instagram profile page links to a grid where clicking on each photo takes shoppers directly to the product page of their website. If a Twitter post features a product, a link is included to take shoppers directly to the Nordstrom website. Once on the website, shoppers can add the featured items straight to their shopping cart or search products by store, to see if their preferred location has it in stock. Winner of USA Today’s 2017 Reader’s Choice “10 Best Budget Hotel Brand,” Red Roof Inn earned its spot not only by listening to guests, but by thinking strategically about which channel to focus a limited budget. Finding it difficult to defeat larger competitors for “top results,” Red Roof Inn used a geo-targeting mobile search strategy to find a very niche group of travelers: those with cancelled flights. With properties near some of the busiest airports in the country, Red Roof Inn capitalized on unlucky travelers by using mobile search to direct stranded travelers towards hotel properties. Marketers can win big by using not only location-based marketing, but also by targeting micro-moments, such as flight cancellations or delays, for when customers are most likely to turn to their smartphones to solve unexpected problems. By running a paid social ad or retargeting campaign for specific regions, you can personalize the content in order to localize the experience. As we highlighted in our post about omnichannel retailers, Sephora connects shoppers from online to offline by offering touchscreens that can help with a makeover. With in-store beauty workshops, shoppers can get complimentary makeovers from expert stylists and use touchscreens to test foundations, concealer, perfume and more, right there in the store. This removes a lot of friction between trying on countless products by streamlining the process with the ease of a touchscreen, but keeping the human touch with a stylist. The best kind of omnichannel experience makes things as smooth as possible for shoppers, however they want to research and buy products. Sephora does this by merging online and offline innovations within the retail space, while providing a memorable experience at the same time. Brands and retailers struggling with their own omnichannel playbooks may want to invest in the kinds of experiences that keep shoppers engaged both within and outside the store. In our recent report with Forbes Insights, we share exclusive research about how marketing execs from retailers and brands are working on data strategy, challenges, and opportunities. Data is definitely a top priority for most marketing execs. Four out of five brands already know that data is critical and have started using it across different marketing channels. The report, “The Commerce Data Opportunity”, interviews 500+ marketing executives across retailers and manufacturers and shows exactly what’s happening in the data landscape. Learn more by downloading the full report here, and check out our interactive eBook, The Smart Marketer’s Guide to Omnichannel.